In honor of the 30th anniversary of Pac-Man, as celebrated by Google over the past few days, I thought I'd come up with something Pac-Man related that was a bit obscure. The easy post here would be about a high score or the Saturday morning Pac-Man cartoon. But how about a few small pieces from my second-grade sticker collection? 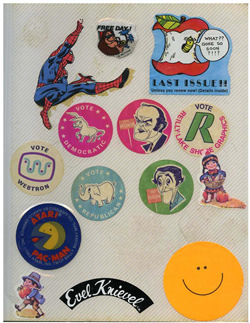 Just like most of my classmates, I had a sticker collection -- mine was stored in a photo album with ducks on the cover. 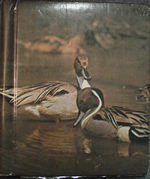 While I had no particular love for ducks as a kid, I assume that I must have had a pretty limited selection of photo albums at the local Wal-Mart and therefore chose ducks over the other cover options. If ducks were the best option I had, I'm curious to know what my other choices were. Anyway, my sticker collection was home to stickers ranging from small stars I got at church for regular Sunday school attendance to the label off my dad's bottle of Coors. Second grade for me would have been 1983 -- a time when Pac-Man and other video games were hitting some of their highest popularity. Of course, this means there were video game stickers in my collection as well. Flipping through my sticker collection, I found two pages with stickers related to various video games. 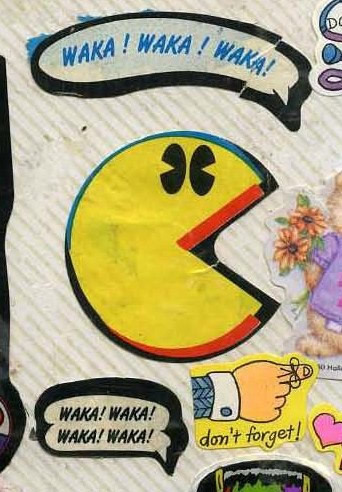 I'll look at the Pac-Man stickers more closely in a moment, but first, take a minute to give the image on the left a good look -- there's Donkey Kong, Mario, and even a Tron sticker. I realize that the "Waka! Waka!" stickers below refer to the sound Pac-Man makes as he moves his way around each level of the game, but I can't help but think of Fozzie Bear laughing at his own jokes instead. Waka! Waka! I don't exactly know what the purpose is of the "Pac-Man is Coming" sticker. Maybe a warning to any un-chomped ghosts to be on the lookout? I would assume so because of the eyes around the edge of the sticker. I am more intrigued, however, by the sticker above that one. "Don't Play This Game...Pac-Man is Better." 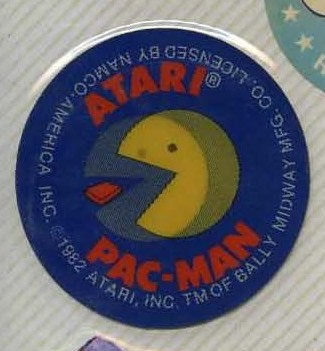 Apparently, kids were supposed to put this sticker on other video games to encourage people to play Pac-Man instead. But where to place the sticker? Over the coin slot? Directly on the screen? I can only imagine the fury in the eyes of a pizza joint owner having to scrape some punk's sticker off his Asteroids machine. 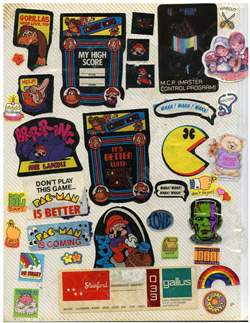 More details about these stickers can be found as part of a pretty nice Pac-Man collection found on bubbledog.com. Take a look for yourself to see the entire set. This last one, I wish I knew more about. This sticker is one of those that alternates between multiple images as you move in your hand. I don't remember for sure, but I want to say that this sticker came in the mail as some sort of promotion associated with our Atari 2600 system. I'd love to know for sure.